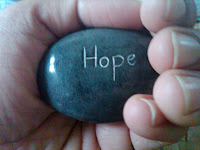 I think of you this morning, light a candle for each of you around my hope stone. I hold hope for your prompt release every moment of every day. I speak for you, I fight for you every moment of every day. I hope you are able to feel that energy and know that you are not alone. There are hands around the world joining together to surround you in one big circle of love. I hope you are able to feel that immense love with you always. I hope it gives you peace and comfort. I hope it brings you home to us soon. Very very soon.